On this page we will discuss how to use free web-based open source project management software WebCollab in medical field. Some people are surprised that it is possible to use project management system to track patients and clinical events, but with several rules and tips it is very feasible. In many cases it is used for medical, clinical or research follow-up tracking. Other uses include research paper development, grant and report writing, etc. First we will focus on hands-on usage tips for WebCollab users (most likely clinical or research staff) with the focus on how to create, manage, clone projects so it would be easy to adapt to various clinical follow-up situations. Second part of this tutorial page is dedicated to the IT staff and webmasters. This section will focus on technical tips how to make WebCollab more user friendly. Caution: Do not forget about HIPAA! First we will do a quick assessment of current situation. Write down protocols that have patients on active follow-up. Our goal is to capture current situation and move forward. There is no need to spend time for the patients who finished follow-up or actions that are already completed. CCCWFU 97609 - 7 pts. CALGB 80702 - 14 pts. ECOG E-2108 - 23 pts. You might start with an "easy" protocol that doesn't have a lot of patients and have simple treatment and follow-up procedure. It will help you to start using WebCollab and to gradually gain experience and feel of it. Now we will create a project for the protocol which will be a container for the patients randomized for that protocol. In our case patient will be represented by a task and all actions related to that patient by the sub-tasks. Note: you can see that we set the status for this project to "No deadline set". That's because it is just a container to add protocol patients, it doesn't have a due date. Usergroup is set to "Clinical", so all CRAs could see the project. "Anyone in the usergroup can edit" is set to ON, so in case you would be away, other CRAs could take care of this protocol/patient. Next we will add protocol patient (task) and treatment or follow-up actions (sub-tasks). It will serve as a base for the template which later can be used to easily add new patients. Each patient's follow-up project can be very extensive and for that reason (especially for new WebCollab users) it may look overwhelming and may be considered to be a big waste of time. That's why it is a good idea to start small and then add details to the plan when user becomes accustomed to the system and starts to realize all those benefits that WebCollab gives in return. First we will create a follow-up plan for the RTOG 0436 protocol patient, which later can serve as a template for new patients. Note the deadline date. Because it is a template patient, we selected an "easy" date so we can calculate deadlines for tasks and subtasks accordingly. Later when you will clone the project, you can enter real due date and all dates of task and sub-tasks will be adjusted in relation to the deadline automatically. 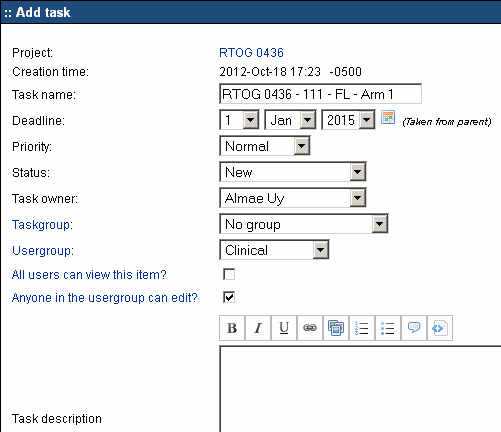 Usergroup is set to "Clinical" so all CRAs could see the task. "Anyone in the usergroup can edit" is set to ON, so in case you would be away, other CRAs could take care of this protocol/patient. Just to have deadlines set for these major steps already gives you a better view of what's going on with the patient. If you need more detail oriented follow up, you can expand this schema by creating subtasks for each parent task - see example below. Note: simpler approach would be to add additional information under the description of the parent task, but in that case you cannot assign deadlines for those additional "tasks" and you cannot check them "Completed" after finishing them. That information would serve you only as a reminder what should be done, assuming everything will be completed on the same day. In this scenario it makes sense to have a very simple task structure or expand structure "as you go". 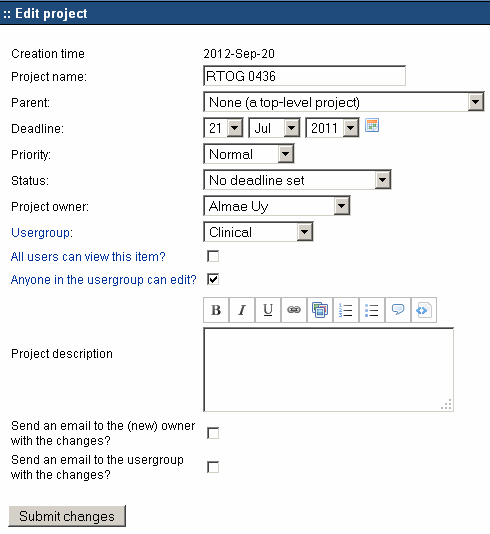 In this example you would start only with the first few tasks and subtasks and would add new ones "as you go". To have a sense what's coming up, I would recommend to enter at least 3 tasks in advance. This would let you have a better prediction for your work schedule. Cloning of the tasks is not so effective in this case, because most likely your template would cover only first steps of patient' treatment. Now that we have a simple patient follow-up plan, we can clone it and use it as a base for new patient. To clone follow-up plan, first we will have to click on it. Once inside our desired task, on the left menu we will see a menu item: [Task options] - Clone task. 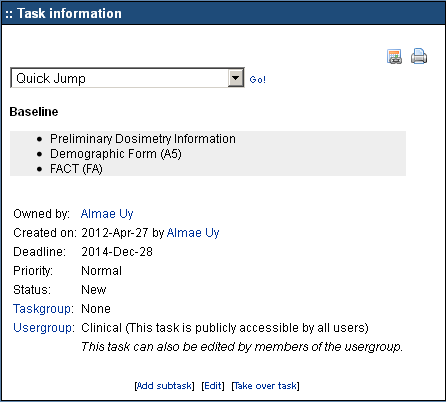 After filling in the new task name and assigning new deadline, our task will be saved on the Home screen. Now we will go to home screen, to find our task. Click on it and once inside, hit [Edit]. On Edit screen select new parent project - our Protocol RTOG 0436. Having good grasp of WebCollab system, you should be able to transfer follow-up plans of all remaining protocols and patients. From this point data should be updated and added on a regular basis, so you and your colleagues could rely on the system. 7. Caution: Do not forget about HIPAA! The fact that you need to login in order to use WebCollab, doesn't make it HIPAA compliant. If WebCollab is not running on closed network or is not hosted at HIPAA compliant web hosting company, you should assume that HIPAA requirements were not met and you cannot enter to WebCollab any information that could be used to identify patient. Our example (RTOG 0436 - 111 - FL - Arm 1) shows only patient initials and study ID, which do not provide enough information to identify an individual patient, so it is in agreement with HIPAA rules. Same rules apply to all information entered to WebCollab: task names, descriptions, comments, etc. and replace the last value with 20 or some other number of years that you need.